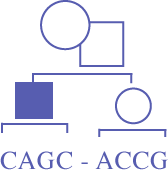 One of the goals of the CAGC in 2016 was to improve and streamline the organization's communications efforts, including reinventing Genetic Counselling Awareness Week. Starting in 2017, rather than focusing only on one week, awareness will be promoted year-round! We are aiming to partner with a different patient advocacy or rare disease group every month to promote the genetic counselling field. If you are interested in collaborating on an awareness project, please contact the Genetic Counselling Awareness Committee co-chairs. We are currently in the process of recruiting committee members and choosing the right group for this inaugural Genetic Counselling Awareness initiative. In the coming years, the initiative will expand to more and more collaborations throughout the year, and hopefully become a streamlined and successful effort. We will update the CAGC membership and genetics community via the CAGC website, CAGC Facebook page, and CAGC Twitter handle as we move forward. We are looking forward to this exciting new initiative, and hope you are too!